KANE recently sponsored research that surveyed 250 logistics and supply chain executives on the subject of labor management strategies in the warehouse. Read the full report. Respondents are clearly worried about a potential shortage of available warehouse labor. The turnover rate for warehouse workers, according to the Bureau of Labor Statistics, is 36 percent. The Material Handling Industry reports that the logistics industry will be looking to fill about 1.4 million jobs, or roughly 270,000 per year, by 2018. These statistics clearly have companies worried, and getting the RIGHT PEOPLE seems to be their top concern. 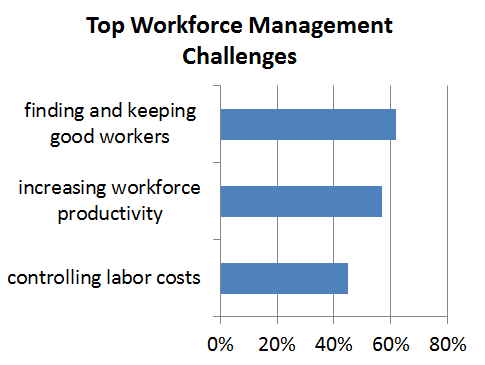 Improving productivity is also listed as a major workforce management challenge. But, interestingly, 85% of respondents rated warehouse staff productivity levels either “above average” or “on par” with other companies. But our research suggests that companies view associate productivity as a whole and may not have as good a handle on individual worker productivity and how one worker compares with another. If they can’t measure and monitor at the associate level, it limits companies’ ability to leverage individualized performance management. Labor management systems (LMS) help in this regard. Of the companies in our survey who employ an LMS system, nearly all report significant productivity improvements as a result. More on that in a future blog post.